Grand Central Life & Style, 9781455553327, 352pp. Serve sophisticated, satisfying food--regardless of kitchen's size or scope--with recipes and advice from award-winning chefs Joseph Ogrodnek and Walker Stern of Brooklyn's Battersby and Dover fame. Ogrodnek and Stern cook stellar meals in their restaurant Battersby's small (4 x 6') open kitchen where they break boundaries with taste combinations and levels of flavor. To pull off world-class food in such tight quarters, they have developed systems of organization founded on a roster of dishes that are largely prepared in advance (sometimes days in advance) and finished just before serving. And that is how they have organized their first cookbook: each recipe is divided into "to prep" and "to serve" instructions. And the recipes--from Crispy Kale Salad with Brussels Sprouts and Kohlrabi to Duck Breast with Quince and Radishes, from Corn Soup with Shrimp to Apricots with Honey and Sweet Ricotta--will make your meals memorable! 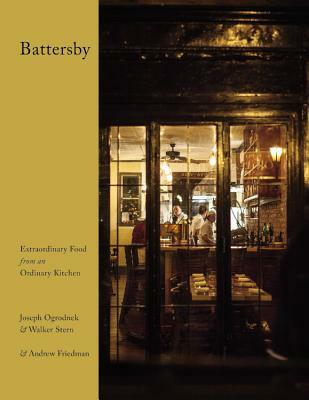 Joseph Ogrodnek and Walker Stern are the chef-owners of Brooklyn's popular restaurants Battersby and Dover. The two chefs, who attended the Culinary Institute of America, worked together in the kitchen of Alain Ducasse as well as other top NYC restaurants. Andrew Friedman, founder of Toqueland and author of Knives at Dawn, has collaborated on books with chefs including Alfred Portale and Michael White, receiving two IACP awards for his collaborations.